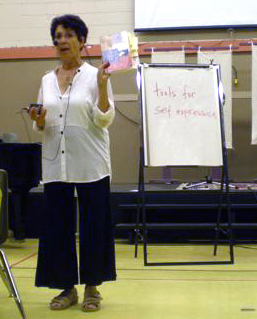 Barbara’s programs are used in a variety of settings, with all populations. They range from 2-3 hour events to full day, and can be combined for week-long intensives. All sessions combine discussion and exploration of one or more of the following: Sound and Rhythm, Dance, Storytelling, Visual Art. Sessions vary in length from a 20 minute energizer or a full week multimedia retreat, and anything in between. Playshops and Workshops run from 60 minutes to 3 hours, retreats from one day to a full week. You may choose from one of the programs she has already developed or Barbara can design a program specifically for your group. Fees and travel expenses are negotiable.